Jinggangshan University, founded in 1958, is an institution of higher education jointly supported by the Ministry of Education of P.R.C. and Jiangxi Provincial Government, and pair-assisted by Tongji University (a top-notch university in China). The university’s administrative authority at a higher level is the Jiangxi Provincial Education Department and its school-running level and category are fixed as a full-time comprehensive university. With an area of 2440 mu, Jinggangshan University is composed of 15 teaching schools, covering 11 disciplines, including economics, law, pedagogy, literature, history, science, engineering, agronomy, medicine, management and art. The university offers 80 undergraduate majors and one master’s program. Currently, it has more than 18,000 current full-time registered students including 532 foreign students from 31 countries. 2.2 Non-degree Chinese Language Programs: unlimited number. 3.1 MBBS Undergraduate Program: With six years’ schooling length, this major adopts the 1+5 model, in which they focus on Chinese language study coupled with one or two basic medical courses in the first year. Those who have passed the HSK(Level Three) examination (150 points or above) before the end of the first year in university can be transferred to the second year of study. And those who fail to meet the requirement can choose to repeat or drop out. The longest schooling length for repeaters is not more than eight years. 3.2 Civil Engineering Undergraduate Program: The length of schooling is four years. 3.3 Chinese Language Programs (non-degree): Spring Program and Autumn Program are available, either lasting for one month. 4.1 Undergraduate Programs: Aged 18 to 25, non-Chinese citizens with senior high school diplomas or above. 4.2 Chinese Language Programs(non-degree): Aged 18 to 40，non-Chinese citizens with senior high school diplomas or above. A. Undergraduate Programs: Deadline for application is September 30th. B. Language Programs: The deadline for Spring Program is April 30th and September 30th for Autumn Program. A. All applicants should hold a valid passport, be healthy physically and mentally, be good in character and submit non-criminal record. They will abide by the laws and regulations of Chinese government, obey the university regulations and respect Chinese people’s social custom and habits. B. Applicants for MBBS Program should technically have a score higher than 65% of the total score in such courses as English, biology and chemistry. C. Applicants for Civil Engineering Program should have a pass score or above in such courses as English, mathematics and physics. D.Non-criminal record certificate provided by their residence police station or proof of school performance provided by his /her school. E. An economic guarantee by a person (including a foreigner who has a regular job in China) or company, or an income proof from parent’s employing organization, or a certificate of bank saving. F.Physical examination result from officially recognized hospital. G. Photo (The requirements are the same as passport photo). H. Chinese language learning experience proofs or HSK Certificates (if any). Please understand that we will not return the above-mentioned application documents no matter whether the applicant is admitted or not. B. Send the paper manuscripts of application documents required above in 6.1 to International School of Jinggangshan University. Delivery Address: No.28 Xueyuan Road, Qingyuan District, Ji’an City, Jiangxi Province, P.R.China. A. On the premise of meeting basic requirements for admission, undergraduate students are enrolled from high to low scores in accordance with the principle of score priority. Non-degree Chinese language program applicants are enrolled successively according to the time we receive their application. B. On equal terms, those applicants who hold certificates of Chinese Proficiency Test(HSK) or have Chinese learning experience will be preferentially admitted. A. Documents Review: Jinggangshan University Admission Committee guides the International School in review of the applicants’documents and form a list of students to be admitted for validation of the university leaders. B. Admission Validation: The university leaders will validate the students to be admitted and then form a formal document with name list to the university president for ratification. C. Admission Approval: The formal document with president’s ratification and the JW202 will be sent to Jiangxi Provincial Education Department and the Jiangxi Provincial Foreign Affairs Office for approval. D. Admission Notice Delivery: After the admission is approved, the International School is to mail the Admission Notice, the Oversea Student Visa Request Form (JW202 form) and the Admission Letter to the admitted freshmen. A. Registration fee is one-time charged when freshmen enter school and that item of fee is no longer charged from the second academic year. B. If MBBS students return home country for internship in their last year, their tuition fee is halved, and their accommodation is free of charge. C. All freshmen shall purchase insurance before enrollment. Insurance fee varies from RMB 300 Yuan to RMB 800 Yuan for one year. The university will refuse to do registration for those who fail to buy insurance on time. Jinggangshan University is an executive institution of higher education for Jiangxi Provincial Government Scholarships to recruit international students to China. In addition to the Jiangxi Provincial Government Scholarships, the university has also established excellent International Student Scholarship at the university level in accordance with relevant provisions, to reward those who are excellent both in character and learning. A. Any freshman who holds Level Three certificate of Chinese Proficiency Test (HSK3) or above can obtain a scholarship when entering school, the amount of which varies from RMB 3000 Yuan to RMB 5000 Yuan in accordance with the certificate grade. B. MBBS students can apply for the university level scholarship each year during their study in our university. If they meet the requirements of the scholarships appraisal, they will receive a scholarship varying from RMB 2000 to 10000 Yuan. C. Civil engineering freshmen who have paid the tuition and all the fees of the first year and get registered before the appraisal meeting of the provincial level scholarship (regularly happens in the last ten days of November), can obtain provincial scholarship which amounts to RMB 20000 Yuan. Our university will divide the scholarship into two halves: the first year RMB 10000 Yuan and the second year RMB 10000 Yuan. From the second year to the fourth year, civil engineering students can apply for the university level scholarship ranging from RMB 2000 to 10000 Yuan each year. 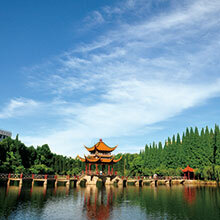 University Address: No.28, Xueyuan Road, Qingyuan District, Ji’an City, Jiangxi Province, P.R.China. Correspondence Address: International School, Jinggangshan University, No.28, Xueyuan Road, Qingyuan District, Ji’an City, Jiangxi Province, P.R.China.